Clarksville, TN – No. 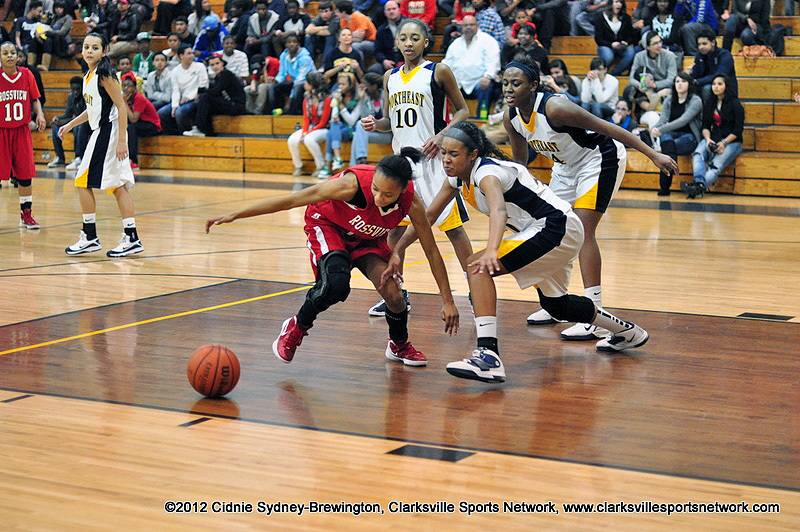 3 Clarksville High School and Rossview High School won District 10-AAA Basketball games Friday night. Clarksville High School beat Dickson County 81-27. Rossview High School held off West Creek 53-39. Montgomery Central High School lost to Waverly 56-29 in a District 11-AA basketball game. Clarksville, TN – Both Rossview High School girls and No. 3 Clarksville High School girls picked up District 10-AAA victories Tuesday night. The Rossview Lady Hawks beat Northeast 68-32 at the Eagles Nest. Clarksville High toppled West Creek 69-28 at the WCHS gym. Clarksville Academy lost its District 10-A game to McEwen 54-26. Rossview's Dayisha Skelton (left) and Northeast's Nataszja Freemon chase a loose ball. Rossview won the game 68-32.